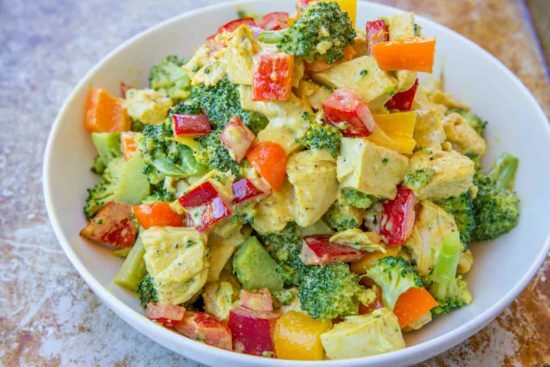 Mango Curry Chicken Salad made with a curried greek yogurt dressing is a healthy salad you’ll want for lunch every day and its fuss free since it’s served cold. 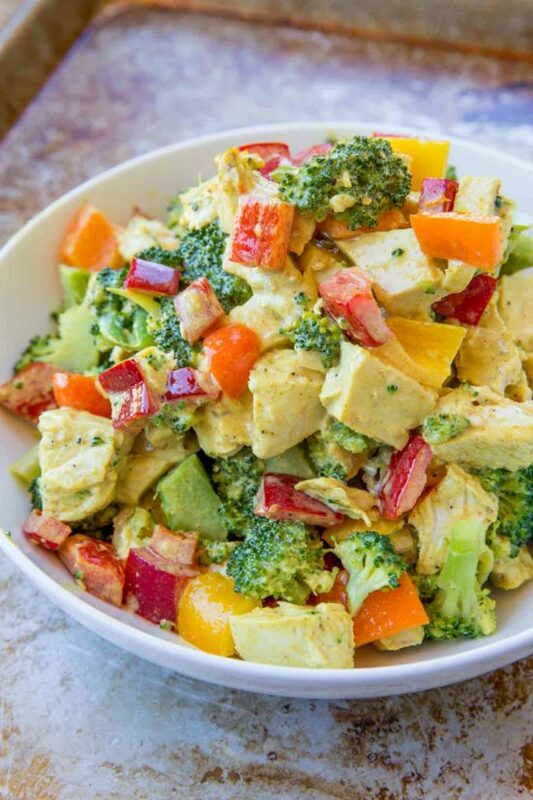 Mango Curry Chicken Salad with plump chunks of fresh mango (frozen works great too! ), curried yogurt dressing, bell peppers and grilled chicken breasts is the perfect sweet and savory chicken salad you’ll crave all year long. 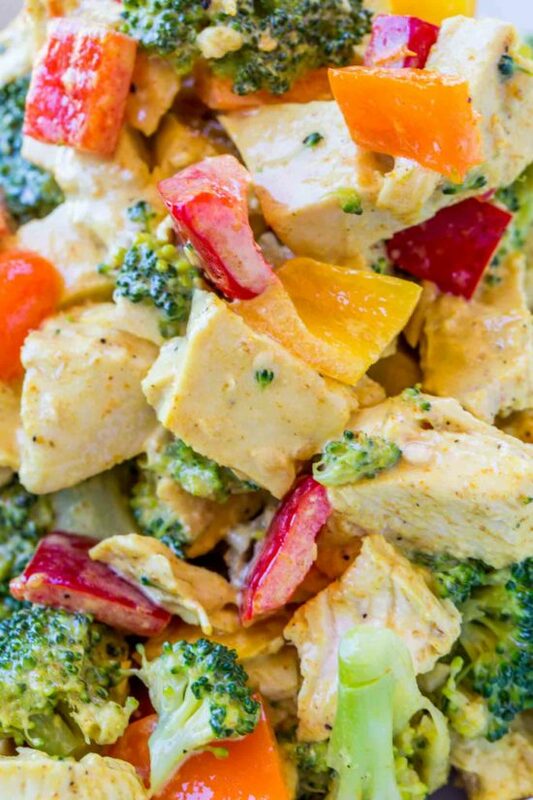 This Mango Curry Chicken Salad is so easy to make and absolutely perfect for making ahead and serving for lunch. Sweet and colorful bell peppers with crunchy fresh broccoli. Sweet, juicy mango chunks that add a burst of flavor. Curry flavored greek yogurt dressing for a bold (not spicy) flavor that helps season all the chicken and vegetables. The best part? 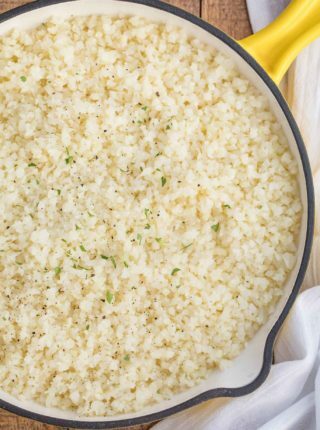 It comes together in just a few minutes and is PERFECT for meal prepping. Best things to serve this with? lettuce (butter lettuce would be amazing here) with some grape tomatoes for a quick salad. a pita pocket for a quick sandwich. a large beefsteak tomato cored out for a beautiful presentation. Cut up some avocado chunks and toss the salad with it for extra fats. 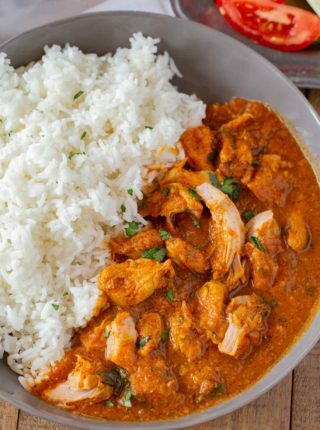 Curry Powder: A mild, hint of sweet and overall delicious curry powder. Pig Tail Flipper: I use this to flip almost anything in a skillet or grill without damaging the skin/breading/seasonings and its super easy. 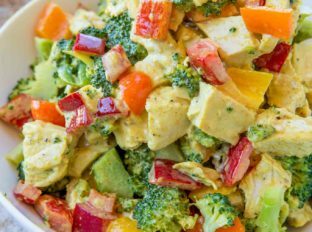 Mango Curry Chicken Salad made with a curried greek yogurt dressing is a healthy salad you'll want for lunch every day and its fuss free since it's served cold. Cut the chicken breasts into 1" chunks and season with salt and pepper. Heat a cast iron skillet on high heat and spray with cooking spray. 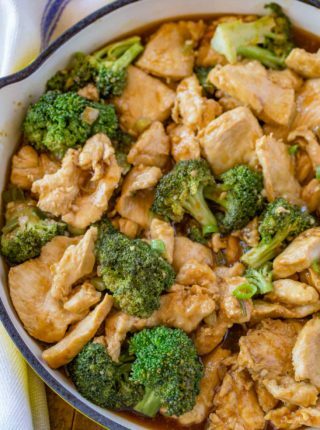 Cook the chicken for 3-5 minutes, stir and cook and additional 2-3 minutes until cooked through. Let the chicken cool and in a large bowl add the yogurt, curry powder, lime juice and lime zest. Whisk well then add in the vegetables. Finally add back in the chicken and the mango and toss well coating all the pieces in the dressing. I made this for lunch and it was colorful and delicious. Next time I will decrease however the curry powder by at least half, for personal preference, also rather than greek yogurt, I will use regular zero fat for a more creamy consistency. I also needed a hint of sweetness in order to counter the intense curry and lime so I used Stevia. 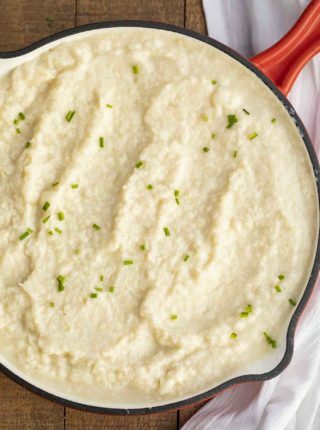 Personally I find this recipe to be amazing! You get a lot of vegetables, it is colorful and most of all … healthy. I also used frozen mango as suggested and it worked out beautifully. Those sound like great swaps! So glad you enjoyed the recipe! Absolutely! Granny Smith apples would be a great substitute! Mango is one of my favorite fruits, and I really love these flavors! I love how colorful this salad is! This chicken salad sounds so flavorful! I need to make it for lunch this week! I am loving everything about this!! Its fantastic!! There is so much deliciousness in this chicken salad!! Such a great lunch meal prep to add to the rotation! What a great recipe! So gorgeous chicken salad! I love the idea of this in lettuce wraps! 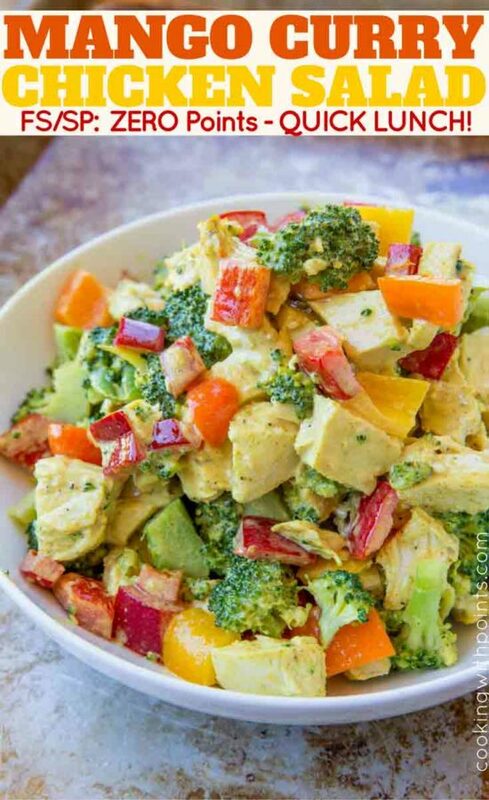 Curried chicken salad is my favorite but I’ve never thought to add mango. Can’t wait to give it a try!